Maintaining a gluten free diet isn’t easy or cheap. Though going gluten free is a popular trend right now, for those who suffer from Celiac disease, a gluten free diet is a must to keep symptoms at bay. 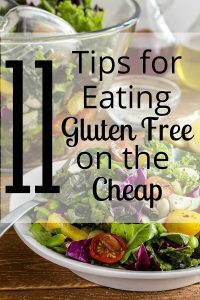 Gluten free products are pricey so I’m sharing 11 tips for eating gluten free on the cheap — without giving up the flavor! Thanks to reader Bill for the post suggestion. Here are my tips and tricks to eat gluten free on a budget. 1. Eat foods that are naturally gluten free. Luckily, there are many items in the grocery store that don’t contain gluten. Add fruit, veggies, beans (dried or canned), and rice to your weekly menu. Quinoa is also a good gluten free option. Keep produce prices down by shopping for seasonal fruits and veggies, or buying frozen. 2. Chomp on good old fashion meat. Meat that hasn’t been processed or infused with artificial ingredients tends to be gluten free. To stay safe and nix costs, stay away from meat that’s marinaded or prepared. Most marinades and salad dressings contain gluten or casein, so make your own! Tamari is a great substitute for soy sauce if you make a stir-fry. 3. Avoid gluten free versions of bread, wraps, and pie crusts. Gluten free substitutes are expensive. Sometimes even double the cost of their counterparts! Make your own instead. It takes a bit more time, but worth the savings. Shop for naturally gluten free flours like almond, rice, and tapioca. I like looking for these in the bulk section of the grocery store, where per pound prices are usually less than the prepackaged stuff. Also, Bob’s Red Mills makes some great cookie mixes and you can find coupons online. Google “Bob’s Red Mills coupons”. Note: Reader Alicia suggests AVOIDING bulk bins because of the risk of cross contamination from another shopper. 4. Get your snack on. There’s no need to deprive yourself. Munch on healthy gluten free snacks like grapes, or celery with your favorite nut butter. Nut butters and nuts are gluten free! 5. Give in to your pasta cravings! There are many alternatives to expensive gluten free pasta. Rice noodles are tasty and can be found for cheap at Asian markets like 99 Ranch. Spaghetti squash, when in season, can be found at a bargain price. Just roast in the oven with some olive oil and sea salt. Once it’s tender scoop the springy flesh and top with your own marinara sauce! I like making lasagna with zucchini instead of pasta to cut down on calories. Pasta has a very long shelf life so stock up for several months when they are on sale! 6. Make your own broth. Don’t bother buying expensive gluten free broths. Make your own with water. Toss in celery sticks, carrots, onion, garlic and herbs of your choice. Simmer for 2-4 hours, then strain, cool, and freeze. If you add salt, keep it to a minimum. You can always add more later! 7. Learn to read ingredient labels. Learn the terms you should be watching out for while shopping for gluten free food. Once you know them it will shorten your shopping trips. Remember, the more time you spend in the grocery store, the more likely you are to overspend! 8. Give in to dessert. Stay away from anything that contain chunks of cookies, dough, or ice cream sandwiches. Instead, buy frozen pops or even better make them yourself to slash the cost! Smoothies are another yummy option you can easily make at home. 9. Limit gluten free items. Only buy enough gluten free foods to feed the person in your household that has to follow a gluten free diet. You’ll save money by buying fewer alternative products. If you are eating gluten free to lose weight (it works if you cut out all those yummy pastries, right?) avoid paying for specially labeled gluten free products whenever possible. They’re convenient – but you pay a high price for that ease. 10. Plan your meals. If you have a list of recipes and the ingredients you need, then you are less likely to buy things you don’t need. This is especially helpful for those following a gluten free diet as most pre-made, marinaded, and dressed food is not gluten free. Plan ahead to buy herbs that you’ll use up during the week. Not only will this add flavor to your food, but it will also cut down on your grocery bill. 11. Some dairy is OK. Be very careful when buying yogurt or any other dairy product! Added flavors are not gluten free. Plus, many people who have Celiac disease are also lactose intolerant. Natural gluten free milks include regular cow’s milk (not flavored), soy, almond and rice. 2. For anyone with celiac disease, buying from bulk bins is discouraged, due to the probability of cross contamination. Other than the above, great suggestions. @Alicia Thank for your input! I should have been clearer… I’m not sensitive to gluten so the bulk bins are a great option for me and anyone else who is on a gluten-free diet as a choice and not a necessity. @Alicia Thanks for the tip about the bulk bins, though I don’t believe we used the term “Celiac’s disease” anywhere. Will update the post with your note about cross contamination! “Celiac’s disease” was used earlier in the day; kudos to quick editing. Glad to see my comments were noted! BTW, I enjoy the daily tips! @Alicia Thanks for noticing. 🙂 And so glad you enjoy our daily tips!!!! If there’s any question bouncing around your head that is related to money, let us know! We’re always curious what dilemmas our readers are facing. @ Yazmin Thank you for taking my idea and turning it into something amazing. Your article was very well written. As with any special diets, cost is crucial in sticking with it. Thanks again! @Bill Glad you liked the post! We are currently trying to eat more organic food, and getting used to higher price tags is definitely a big part of the challenge! @Dallas M Great suggestions! Thanks for sharing. I would love recipes for GF desserts and pot pies!! I never would have thought of Big Lots! That’s a great suggestion. Buy a pressure cooker and cook your own dry beans. All kinds of variations for soups, stews, etc. Eat with brown rice. Indians know the ropes when it comes to “dal”! Find an Indian friend to teach you some basic recipes like yellow dal and rajma. Dry beans are cheap cheap cheap!!! My biggest saving has been finally finding an everyday breakfast option that I like and that is low glycaemic index – I also react to oats, so I had to miss out on porridge. Now every week I cook a big pot of brown rice. I spoon it into containers and add a spoonful of dessicated coconut and freeze. Then when I cook at work I add some milk, cinnamon and sometimes some honey or brown sugar. A chopped banana also goes well. If you’re cutting down sugar, like me, I find that I now am happy to have the rice porridge without the sugar or honey, as long as the coconut and cinnamon are there. I’ll definitely follow these tips! Thanks for sharing these!